3 minutes later two men came on stage, set up an arch of stairs and climbed to the top. One man did a handstand, the other balanced on his shoulders and they proceeded to hop down, and then back up the stairs. Hard to describe, but it was incredible to watch. For the next hour we were completely mesmerized by fantastic feats of flexibility, strength and coordination. I am including more photos than usual with this email as a picture really is worth more than a thousand words (my words anyway) in conveying how marvelous it was. Children start training when they are 4 or 5, learning basic skills and become specialized by age 9 or 10. They move in ways you really can’t imagine is possible for a human body. These are incredible athletes. Acrobatic work is considered a part of Qi Gong training. This a Chinese breathing and mental control discipline whose goal is too help focus ones attention in order to keep the body and mind working in harmony. It can be similar to yoga, and includes Tai Chi and Kung Fu under its umbrella. When the show ended the boys said ”we must bring every visitor here!” Not a hard task. 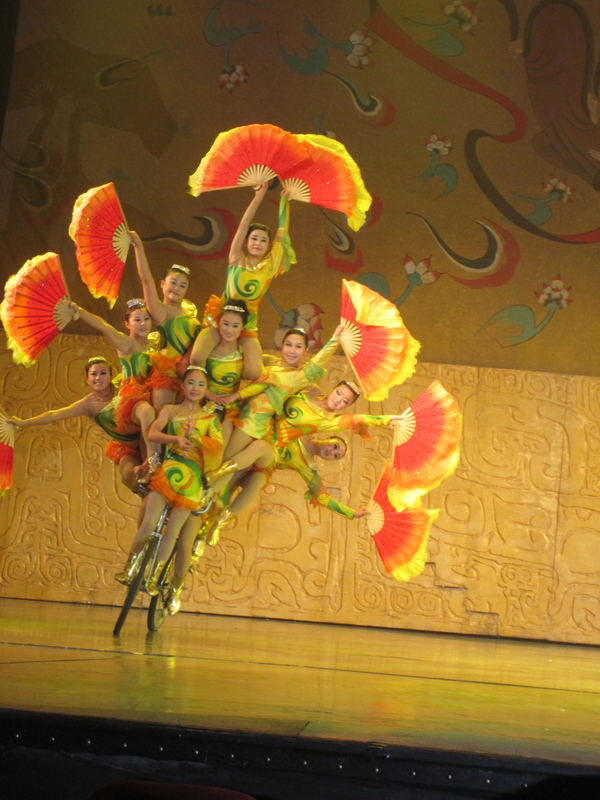 There are over 120 troupes and more the 12000 performers in China, who often travel to other parts of the world. We’ve ended up having many visitors this fall and have added acrobats to our must see list even though the boys now find it a bit boring… UGH! We have had our first snowfall in Beijing. A good quarter inch!! All extracurricular activities have screamed to a halt. Driving has become even more treacherous and frightening. Today I had 8 people in front of my house desperately sweeping up every flake. Chowder went completely ballistic, racing from door to window and back again, barking like crazy! Quite a change from our old Toronto days when I remember shoveling in April!